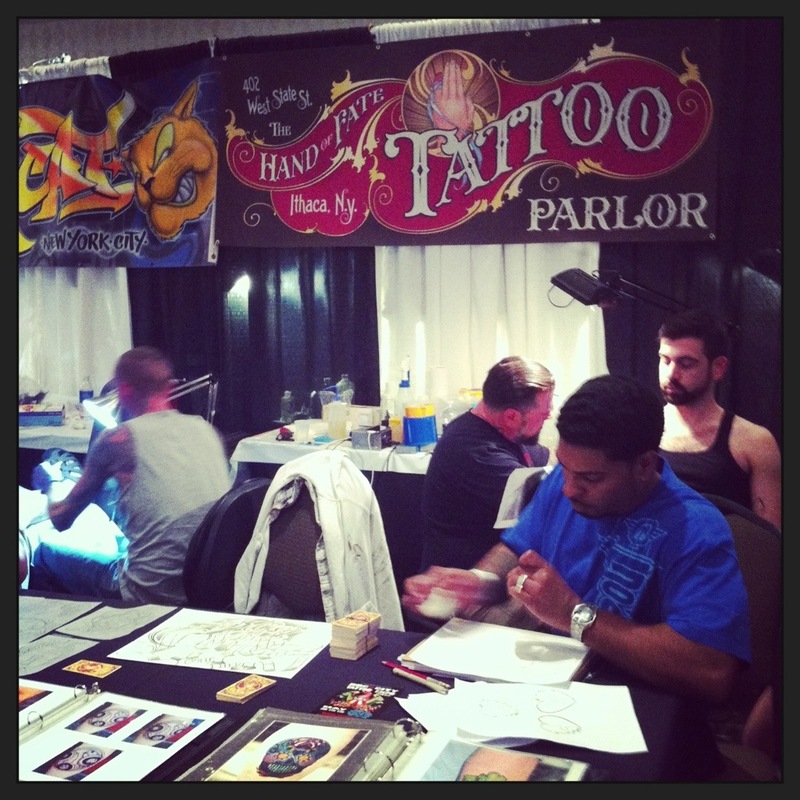 The Roc City Tattoo Expo is Upstate NY’s only high end tattoo convention, drawing an impressive roster of international artists each year to our beautiful area. 2016 saw the 8th annual Roc City Expo in a different venue, the addition of more local artists and vendors, and a focus on artwork as opposed to entertainment and contests. The Hand of Fate has attended every one of these eight years of shows, starting with the first event right after we had opened our business, and relocated to the Finger Lakes. Jet and his crew at Love Hate Tattoo have always focused on bringing the best artists in tattooing, to an area that is often overlooked for larger markets and cities. Rochester is a fantastic town, larger scale than Ithaca, with an artsy, young, downtown crowd and a flourishing dining and entertainment scene. Due to local Finger Lakes wine trails, breweries, and distilleries being less than an hour away, the locavore movement is strong here, and local vintners and brewers are represented along side menu items, sourced from area farms. Iron Smoke Whiskey, a small batch distillery located close to home in Fairport, NY, saw the opportunity to join in on the Roc City Expo fun! FINALLY, a local booze producer that saw the potential marketing frenzy that a tattoo convention crowd offers: exposure to an absolute rainbow selection of adults, from all walks of life, that enjoy quality luxuries. 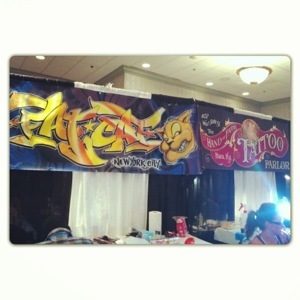 A whiskey tasting at a tattoo convention? YES. SO MUCH YES. Let me say, the whiskey tasting was VERY well received, pouring staff were knowledgeable and answering questions, and I’m sure three days of sales reflected that! Iron Smoke also seem to have a growing distribution to bars and restaurants in the Upstate area, so make sure to keep your eyes open, or request it by name at your favorite watering hole. Iron Smoke Distillery is run by a contact that goes by the name of Skully, and their labeling and merchandise feature a distinguished skeleton, in a suit, smoking a pipe. Very well suited to a tattoo crowd, to say the least. Lots of teeshirts went out the door with that whiskey…. Iron Smoke Apple Wood Smoked Whiskey: small batch, locally sourced grain is mashed and smoked with an apple wood smoking process, before distillation and aging for years in charred, American white oak barrels. With a hint of sweetness on the nose, this smooth amber colored whiskey has a light, smoky, vanilla and apple flavor with a nicely rounded, deep oak finish. Lovely small batch spirit. Rattlesnake Rosie’s Apple Pie Whiskey: Forbidden Apple Pie recipe of small batch house distilled corn whiskey, blended with all natural upstate NY apple cider, brown sugar, vanilla, and cinnamon. Slightly sweet, with the tang of fresh apple cider and a bite of corn whiskey, this potion is delicious on its own, or as a mixer for some beautiful cocktails. Slightly sweet, bright, and luscious long finish. According to their Iron Smoke website, Apple Pie was the winner in the San Fransisco World Spirits Competition–for those of you that follow the medals and events scene! Once again, huge thank you’s go out to Jet and the entire Love Hate Tattoo Rochester crew for all of the hard work and hoop jumping it takes to have such a great show turnout in this area! Hand of Fate has enjoyed the journey since the beginning, and there is always something surprising to enjoy, along with world class tattooing and artwork. This year, BoozyLife felt especially loved! Want to buy your own bottles of Iron Smoke Whiskey? Check out their website here : Iron Smoke Whiskey website –there are awesome cocktail recipes for your newly aquired local whiskey!